Guess who celebrates a birthday on Friday, August 15th… Ben Afleck. No, really, he does. But he shares that awesome day with ME! Yep, I’ve made it another year and to celebrate I’m offering a giveaway. Not only will I be giving away several ebooks of the first three books in the HAEDYN CHRONICLES, but a few of my author friends are joining in, too! 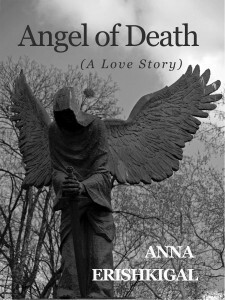 The Angel of Death falls in love with a mortal in this tale of true love, reincarnation, and forgiveness that spans from ancient Carthage to the current Iraq/Afghanistan war. Water can be deadly, in the right hands. In a world of magic, hidden away from those who have no power, Tarian Xannon commands the natural forces of water, air, and fire. As heir to the Dolphin Throne, her job is to learn what it takes to lead—but she’d much rather forget the heavy weight of responsibility in the waves of the ocean. When a power play for the throne ignites the Succession Ritual, Tarian is forced to make hard choices about the future of her unborn child, House Xannon, and the very fabric of magical society. As her defenses wane, his attacks grow bolder. All she knows and loves hangs in the balance. A vignette of noir fiction, a Faustian fantasy. A single choice is like a hidden hand of cards that can lead to victory or downfall. Born in the rural South, Lena finds herself half way across the world decades after escaping abuse and neglect. Now, she faces the demons of her past while a terrible darkness awaits. 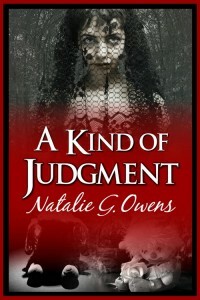 After a fleeting appearance in “A Kind of Judgment”, the mysterious Jonas is back to stir up more trouble. A mother makes a Faustian bargain for her son’s freedom. But can she truly meet the cost when his real prison demands payment of a different debt? When Sarah escapes from her brutal abductors, she promises to return to rescue her twin sister, but with the dead walking the earth she is forced to rely on a coworker who made her work life hell for years. With her coworker weakened by cancer treatments, her sister still imprisoned, and the dead looking for an easy meal, Sarah’s only plan, if she can pull it off, is Survival. 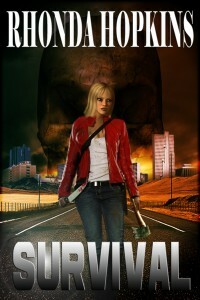 SURVIVAL is a 14,000 word short story – the first in a new zombie apocalypse series. Enter here to get the party started!! It’s here! Digital Book Day has arrived! Over 400 books from authors around the world are being offered FREE to readers. Yes, that’s right – FREE!! Some of these books are advance copies, which means they’ve never been offered before. Seriously, how freaking cool is that? I’m talking about awesome reads from authors like Alex Kava, CC MacKenzie, Joshua Graham, Dale Amidei, Rhonda Hopkins, Stacey Joy Netzel, CJ Lyons, Johnny B. Truant, Sean Platt, David Wright, JF Penn, Bob Mayer and me! Plus so many more I can’t even begin to list them all here. Go to DigitalBookDay.com and see for yourself. I promise, you don’t want to miss this one! I love it when good things happen to my friends. Mostly because they get all excited, which in turn gets me excited. Then I feel the need to share all that excitement and fun with everyone I know. So to start things off, today is release day for PLAN BRADY by L.C. Giroux. This is Book 11 in the Lovers and Other Strangers series, and let me tell you, it’s a good one. I totally recommend this series to all my romance reader friends. Check out this book trailer! Available at Amazon, Barnes and Noble, and iTunes! On to the next item on my “sharing the good news” list. 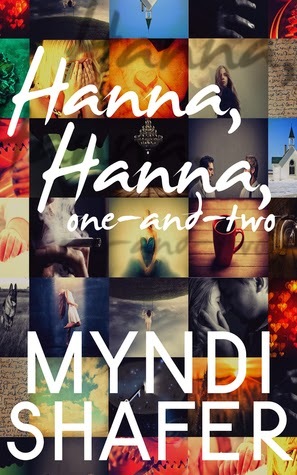 My friend and fantastic author, Myndi Shafer‘s most recently book, HANNAH, HANNAH ONE AND TWO has been nominated for the Indie ReCon’s Best Indie Novel Award 2014. Way to go, Myndi!! There aren’t too many awards for Indie Authors out there so when one of us gets a chance like this, we all celebrate! We also try to support each other the best we can. In this case, that means voting! I’ve already placed mine, but I’d love it if you could do the same. This is just another great story by Myndi. Her first two, Shrilugh and The Darkening were awesome! Her books are always on my To-Read list. Last, but definitely not least – ZOMBIES!! A hot cowboy sheriff will do anything to protect his town. Especially from a once-debutant Zombie who wants to rule the world. Okay, well not just zombies, but a Zombie WESTERN. That piqued your interest, didn’t it? Mine too! 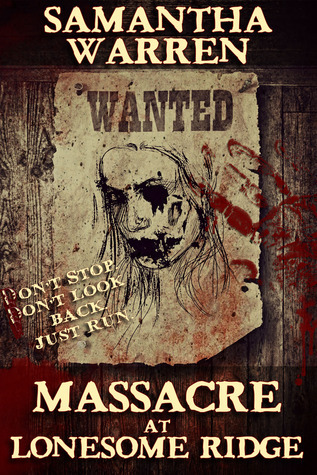 MASSACRE at LONESOME RIDGE by Samantha Warren takes readers straight back to the Old West and gives them all the glory of Zombies, too! It is due to release in 15 days (March 11. 2014) but is available NOW for Pre-Order at Barnes and Noble and iTunes. DON’T STOP! DON’T LOOK BACK! JUST RUN! I Want a Do Over! When I was a kid, if something didn’t go as planned all I’d have to say is “I want a do over!” And then I could just try again. Hopefully with better results. As adults, life rarely gives us that option but sometimes we get lucky. That’s why I love being a self-published author. Being my own boss and having control over my business decisions allows me to try different avenues. If something isn’t working well, I get to try something else. That’s right, I get Do Overs! And of course, I am taking advantage of that opportunity. I recently overhauled my website, Facebook cover photo, and Twitter background for branding purposes. (Oh, the joys of marketing!) I also created a new email list, the Readers’ Portal. As a reader, I enjoy finding ways to interact with the authors I love. My email list is not only a way I can talk directly with my subscribers, but it is also a way I can give back. When one signs up for Readers’ Portal, they’ll be the first to know of sales and special offers, news on upcoming releases, launch parties, giveaways, discounts I’ve created JUST FOR MY SUBSCRIBERS, and sneak peeks at books I’m working on. Plus, I’ll be offering some of my short stories for FREE. These are stories I have yet to publish and subscribers will get them before anyone else. Right now, I’m working on revamping the book covers for The Unnamed and Haedyn’s Choice. I love playing with images and graphics, so for me this was tons of fun. I finally narrowed down the cover choices for Haedyn’s Choice to two. But I can’t decide between them. So, I’m going to ask my email list subscribers to help me choose. I’d love it if you signed up and gave me your input as well! Just click HERE, or you can click the link to the right of this blog. I can’t wait to see which cover you choose. Have you ever taken advantage of a “Do Over”? How did it work out for you? Join the WG2E Beta/Review Club! Do you enjoy getting the first peek at new books? Do you read with a critical eye? We have the perfect place for you! The WG2E Street Team has a new group for beta readers and reviewers, where authors and readers can come together to help each other. What’s the difference between a beta reader and a reviewer? A beta reader reads a book that is still a work-in-progress and provides feedback to the author in order to make the book the best it can be. They are not reviewing the work publicly. All thoughts on the book go directly to the author. The book they read is not the finished product. A reviewer reads a completed book either right before it’s published or shortly after and leaves their opinion of the book on Amazon, Goodreads, Barnes & Noble, iTunes, etc. to help other readers make a decision on whether to read the book. Beta readers are not reviewers and vice versa, though you can do both for different books (or if you re-read the book in its completed form). Once every three months, all authors who used beta readers or reviewers will contribute to the pot and a gift card will be given to one random beta reader or reviewer. Want to find new authors and help out those you love? Head on over to the WG2E Beta/Review Club on Facebook and request to join. Just click the link below! If you’re into paranormal books like I am, you’re always looking for a new book to devour. 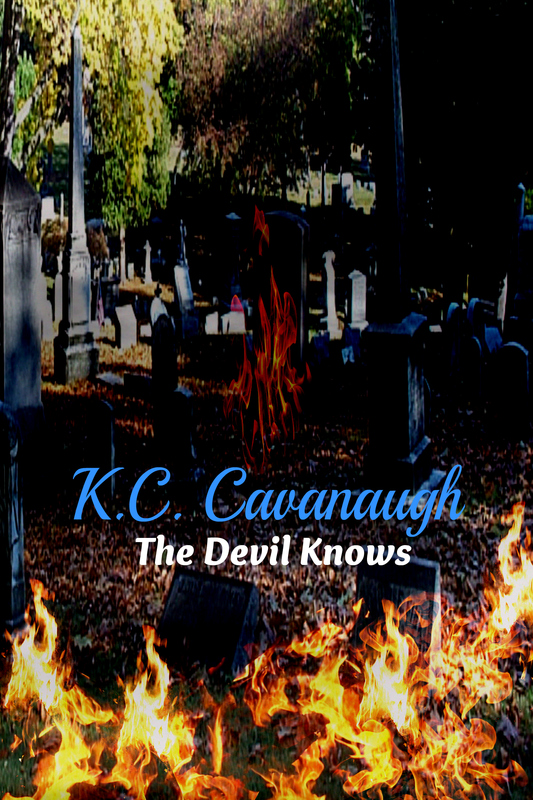 Well I’ve got a new release for you today – THE DEVIL KNOWS by K.C. Cavanaugh. Here’s the scoop on it! The Devil Knows is a New Adult paranormal dramance! College student, Megan, is devastated when she discovers that her best friend, Anya, has been diagnosed with terminal cancer.Stricken with grief, and unable to find conventional answers on how to help her friend, Megan turns to something so out there it couldn’t possibly work or could it?Despite knowing the risks, Megan knows that she may be the only one that stands between Anya living and meeting her maker. That alone gives her the courage to gamble it all against the odds. In comes the devil, and an unlikely alliance forged in something so dangerous it may cost her the ultimate price. Sounds intriguing, doesn’t it? This one is definitely on my Want-To-Read list! K.C. Cavanaugh was raised a small town in Northeastern Pennsylvania. From a young age she had the penchant for creating stories whenever she had the opportunity. K.C. still lives in Pennsylvania where she spends her free time with her family – including her boyfriend, children, and dog. The Devil Knows may be her debut novel, but it will be far from her last! She is currently working her End of Days apocalyptic fantasy trilogy, her Eternal paranormal series, and wrapping up a novella entitled Unforseeable Past. To get the latest news on K.C. Cavanaugh you can follow The Cavanaugh Connection (her blog) at www.cavanaughkc.blogspot.com or like her fan page at www.facebook.com/cavanaugh.kc. Have you come across any new books you’ve recently read or want to read? Feel free to tell us about them in the comments! Intriguing, isn’t it? That’s the tag line for Samantha Warren’s latest novel, The Iron Locket. I was fortunate enough to be a beta reader for this book and I loved it. Very rarely do I get sucked into a book enough that I dream about it but I did this one. What happens when you combine faeries, knights, and humans? War, chaos, and love. 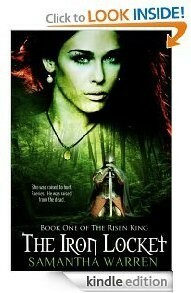 The Iron Locket by Samantha Warren is now available. Grab your copy today! For two straight nights, I dreamed about knights, faeries, and being sucked into portals. It was crazy! But enough about my overly active imagination, let’s talk about this story. I am a huge King Arthur fan, so when Samantha told me about this book – I knew I had to read it. This isn’t your typical story of Arthur and his most trusted knights battling it out in medieval times. On the contrary, it’s set in the present and the king and his crew have to do a little adjusting to modern-day ways. Especially when dealing with the Faery Queens. I was a little leery about the faeries, I’ll admit. But then I found out the main character, Aiofe, hunts rogue faeries that enter the human world. How freaking cool is that? Seriously, that is my new costume for Halloween! So, now I’ve got a Faery Hunter and an Ancient King, all rolled up in one book. And the bad guys? Oh, they are sooo bad – you’ll love them. 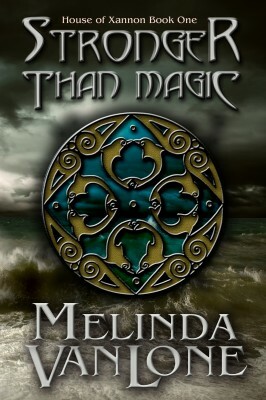 This book brings you into the land of Faery and has you roaming around castles, fighting alongside the Knights of the Round Table and mingling with the Four Faery Queens. And the ending… well, you’ll just have to read it to find out! She was raised to hunt faeries. He was raised from the dead. Aiofe Callaghan comes from a long line of faery hunters. Hired by one of the faery queens, they protect the human world from chaos and destruction. But when Aiofe stumbles through an open door into the land of Faery, she discovers the job isn’t as simple as it seems, and neither is she. Arthur Pendragon spent centuries in blissful nothingness, until the day the four queens banded together to raise him from the dead. Along with his twelve most talented knights, he leads the warring armies of Faery against the greatest enemy they have ever known: one of their own. Can they overcome their differences to confront the greatest challenges either of them have ever faced? 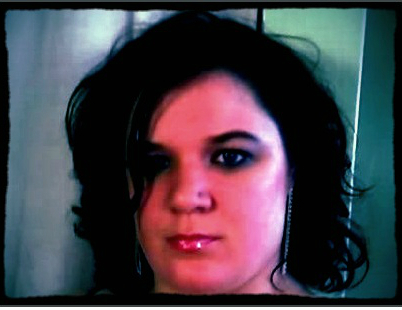 For more information about Samantha Warren, check out her BLOG and follow her on Facebook and Twitter. It’s Read an Ebook Week! That’s right. Sunday, March 3rd kicked off an entire week dedicated to reading ebooks. I’m an advocate of reading regardless of the format, so I’ve got plenty of suggestions on books for you to snuggle up with this week. 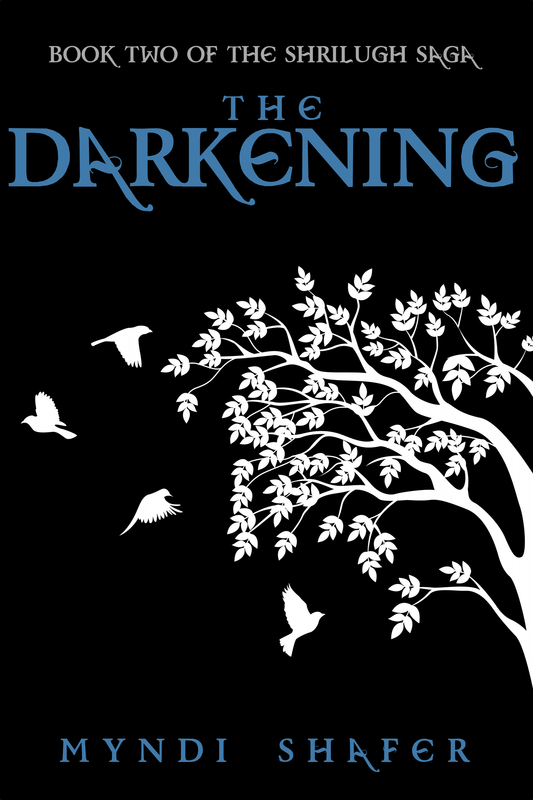 For example, THE DARKENING, by Myndi Shafer. This is book two of the Shrilugh Saga and an excellent follow-up to her first novel. This week only! Book 2 in the Shrilugh Saga is available HERE for only $2!! Grab it now!! As Aydan Fulbert settles into her new life in a new world, she realizes a few things. She’s healing from losing Brig. She’s coming to terms with her new home. And she’s lonely. Rein Torvald’s return from his long absence helps alleviate her loneliness, but a darkness comes with him. Unsettling news about her father and the Sovereign has the potential to make her a fugitive all over again – from his world and hers. Will Aydan allow her heart to be taken places she’s never been brave enough to go? Or will the threat of danger – of the Sovereign’s rage, and her father’s vengeful grudge, send her running? Doesn’t that sound AMAZING?! Wait, you haven’t read Shrilugh yet? No worries. In celebration of Read an Ebook Week, Shrilugh is FREE. And just in case you devour these books the way I did, I’ve got more suggestions and great deals for you this week. That sassy spitfire, CC MacKenzie, is the author of the steamy contemporary romance, Reckless Nights in Rome. Now if you’ve read this one, you won’t want to miss the next books in the Ludlow Hall series. Both, A Stormy Spring and Run, Rosie, Run are 50% off this week. Click the links below to snag your copies! Want a little urban fantasy, too? Check out Samantha Warren is offering several books for free this week. The first book in her JANE series, Vampire Assassin, is currently free and so is book seven, CURSED. As well as her fantasy book, Battle of Black River. And of course, I’m offering THE UNNAMED for free as well. But these prices will only last through March 9th. 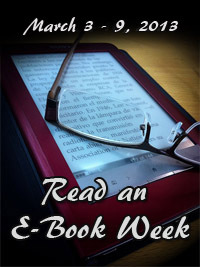 So celebrate Read an Ebook Week with us today. Grab your ebooks, find a comfy spot, and get to reading! Have you read any great ebooks lately? Or do you know of any other great deals going on this week? Leave a comment and share the details! Still trying to find a date for Valentine’s Day? Or maybe you’re just sick of all the hub-bub about that good, old cherub flying around shooting arrows at unsuspecting victims. Either way, I can totally hook you up on Valentine’s Day. And the best part – you don’t even have to leave home. You can rock the Hello Kitty pajamas with your hair sticking out everywhere if you want. Heck, you don’t even have to shave! The kind that won’t forget your name, look at other people while you’re talking, or leave you stranded with the bill at the restaurant. The kind of date that makes you forget all your worries and lets you escape into another time and place. The kind of date that introduces you to people and places that you’ll never forget. I’m talking about setting you up on a blind date with a book. And not just any book – but the kind you love to read. And even better – it’s completely FREE. That’s right. This Valentine’s Day over 30 authors have joined together are giving away their books for free. Samantha Warren created this fantastic event called the Valentine’s Day Book Date Giveaway and it’s going on RIGHT NOW on Facebook. You could receive a book by talented authors such as Samantha Warren, Melinda VanLone, M.G Miller, Steven Montano, Liv Rancourt, Myndi Shafer, CC MacKenzie, Kirsten Weiss, and so many more! Then on Valentine’s day, you will be “matched” up with a book in the genre you like, but we aren’t going to tell you what one it is. (This is a blind date after all!) You’ll meet your “book date” when the author sends it directly to your email address. How cool is that? Not only do you get a FREE book but the actual author is the one that’s gonna send it to you! Let yourself fall in love this Valentine’s Day… with a book! I really like books with a story that just takes you away from your day-to-day stress and lets you slide into the life and world of someone else for awhile. And that’s what happened when I read LILITH by Toby Tate. After reading Tate’s first novel, Diablero, I followed his updates regarding the writing process of Lilith. His excerpts left me wanting more and I was excited when I received a copy of this novel in exchange for an honest review. I’m happy to say I wasn’t disappointed. I believe the author called this novel a “supernatural action-thriller” and I couldn’t agree more. Before evil had a name, there was LILITH. Something has come aboard the U.S. Navy’s newest state-of-the-art super carrier, the USS Gerald Ford, something supernatural and as ancient as time itself. And it’s taking over the crew one by one. Reporter Hunter Singleton and his wife Lisa, guests invited aboard to witness a routine training mission off the coast of North Carolina, soon learn that the CIA is onboard as well, and that some of the ship’s crew are acting irrationally, even violently. When an unexpected monster hurricane slams New York, the ship rushes to assist in the aftermath, and Hunter, Lisa and the crew are faced with the terrifying realization that whatever has come aboard the Ford must be stopped before it is set free on the streets of Manhattan. But how do they fight something beyond human comprehension? How do they kill something that may not even be alive? The clock is ticking…and Time itself is running out. Lilith is filled with action and suspense. Majority of the story took place aboard the USS Ford. Tate gave just enough detail to allow me to feel like I was running through the passageways with the characters as they scrambled to catch up to Lilith, who was always one step ahead. And he had no mercy for his main characters, Hunter and Lisa, a husband and wife duo from his first novel. He dumped them right in the path of a psychopathic, supernatural creature and had them fighting for their lives in no time. I enjoyed learning more about these characters and felt he did a good job developing them. I would have liked a little more background concerning the creature and maybe a deeper POV with the main characters as I think it would have engaged me even more into the story. But he made up for those areas by creating a read full of twists, turns and lots of action. Even though his books aren’t in my normal reading genre, I enjoy Tate’s story-telling and will continue to read his future work. 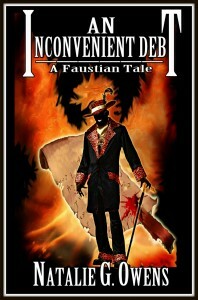 For more information about Toby Tate and his other books, visit his website http://www.tobytatestories.com/ , follow him on Twitter, and Facebook.